Lawn aeration is a process that’s used religiously by the golf course industry and for good reason. It’s a key component of proper lawn care. It’s rare that we sell lawn aeration by itself, simply because most customers opt for a personalized landscape maintenance program. 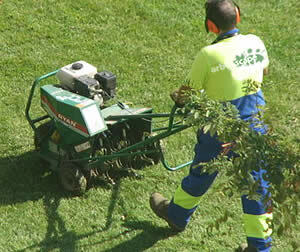 Our programs can include lawn care by itself or a host of other Arborscape Advantage Services. A machine is used to core little holes into the turf. This allows water and oxygen to get down to the bedding of the grass. Without that, the grass will form a thick layer of thatch, which is dead organic material. Over time that thatch builds up. Aerating allows more aerobic activity to get down to the roots. This means more oxygen, water and fertilizer. This is a key component of a really sharp, healthy lawn. On heavily traveled areas the soil gets compacted and aeration helps reduce compaction, providing a channel for more nutrients to access the roots of your lawn. Compaction isn’t good because it’s a catalyst for all sorts of problems to start. We will typically aerate in the late summer before we overseed your lawn. Lawn over-seeding is exactly what it sounds like. We broadcast a premium grass seed mix across your entire lawn. Rejuvenating an existing lawn with a good quality, diverse seed mix, promotes a healthy, thicker lawn. Overseeding is something we do at the end of august. Golf courses do this 2-3 times per year, we do it once a year and it’s part of our landscape maintenance services.